Gwendoline Margaret Ward (Patsack), aged 87 years of Mortlach, SK passed away suddenly on Sunday, February 17th, 2019. Gwen was born and raised in Moose Jaw, SK on November 27th, 1931. She worked at various jobs, including SaskTel and Valley View Centre until her retirement. Gwen loved the outdoors and being in her yard. She was a very avid gardener, having many flowers which she loved. Gwen was involved with Timothy Eaton Gardens and was an avid card player, playing crib, rummy, canasta and nickel bingo. She was also very talented at the art of ceramics, making many different and unique pieces of pottery and ceramics for herself as well as her family, which are now cherished keepsakes. She was predeceased by her parents, John and Pearl Siddeley; and her first husband, Vernon Patsack. 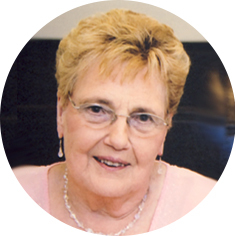 Gwen will be lovingly remembered and dearly missed by her husband, Len Ward; brother, Stan Siddeley; sons, Wayne and Greg (Tracy); grandchildren: Nikki, Tyler (Cassey), Courtney (Matt) Brewer, Morgan (Vashik) Mooken, and Bryson; Len’s aunt, Fern; as well as her furry friend, Mitzi. The Funeral Service will be held on Monday, February 25th, 2019 at 11:00 a.m. in Moose Jaw Funeral Home. Dave Foley will officiate and interment will take place in Rosedale Cemetery. A Time of Visitation for Family and Friends will be held on Sunday, February 24th, 2019 from 7:00 to 8:30 p.m. in Moose Jaw Funeral Home. Flowers are gratefully declined. As an expression of sympathy, donations in Gwen’s name may be made to the Heart and Stroke Foundation of Saskatchewan, 1738 Quebec Avenue, Unit 26, Saskatoon, SK S7K 1V9. Arrangements are entrusted to Moose Jaw Funeral Home, 268 Mulberry Lane. Todd Sjoberg, Funeral Director 306-693-4550. To the Ward and Patsack Families, Wayne and I extend our deepest condolences for your loss….Gwen will be missed. I am so sorry to hear of Gwen’s passing. I have known her, through family, since I was a little girl and always had a chat when we saw each other. Len, my deepest condolences on the passing of Gwen. Take care. Len, sorry to hear your wife passing away. Please accept Olga & and my condolences. Also remember Jehovah God’s promise for those who have dead as mentioned by Jesus in John 5:28,29. I’m so sorry for your loss, Len. Remember and cherish all the good times. Dear Len,I worked with Gwen at VVC .She was a special lady.My condolences to you and her sons and their families. Paul and I send our condolences. Use to see her often when our kids were little. Cherish your memories of your Mom. We’re so sorry for your loss. Our thoughts and prayers are with you.